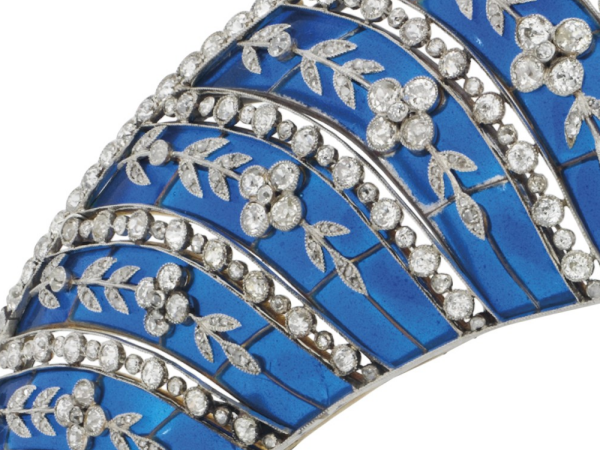 On November 10, Christie's will hold a major jewelry auction in Geneva, and the roster of pieces up for sale includes a number of items with significant royal and noble provenances. 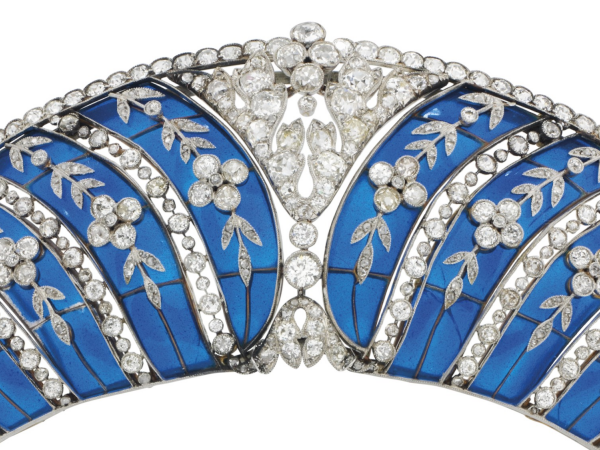 Today, we're looking at the major tiara on the auction block: the blue enamel kokoshnik from the collection of the Duke of Westminster. 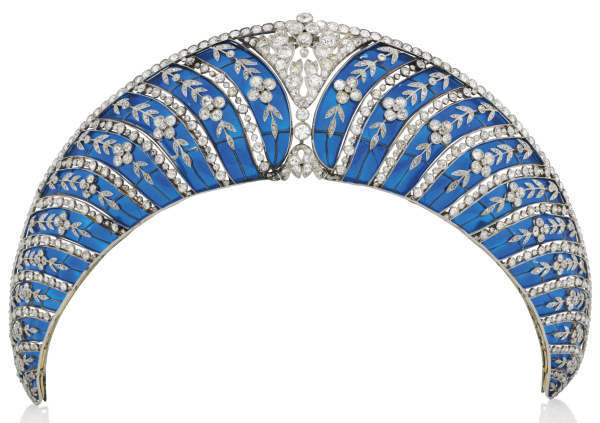 Of Kokoshnik design, composed of a series of graduated translucent royal blue plique-a-jour enamel curved panels, each overlaid with old-cut diamond trailing forget-me-not floral motifs, interspersed with collet-set diamond lines, to the cushion-shaped diamond openwork cartouche centre and similarly-set upper border, circa 1910, mounted in platinum and gold, with a later fitted case. 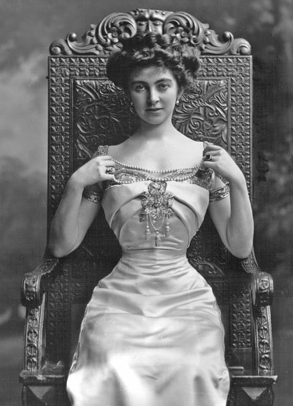 In 1911, Hugh Grosvenor, the 2nd Duke of Westminster purchased the tiara for the first of his four wives, Constance Cornwallis-West (better known as "Shelagh"). 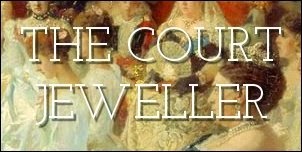 Some have written in the past that the tiara was a tenth anniversary present (the Grosvenors married in 1901), but the notes from the upcoming auction draw a link between the purchase of the tiara and the 1911 coronation of King George V and Queen Mary. The notes don't claim that Shelagh wore the kokoshnik at the coronation; rather, they suggest that Hugh bought the tiara for her because he wanted her to have another jewel to wear at the numerous sparkling balls and banquets held around the date of the coronation. To my knowledge, there aren't any images of Shelagh actually wearing the kokoshnik. Regardless of the magnificent gift, the Grosvenors' marriage imploded for all sorts of reasons, and they were divorced by the end of 1919. It seems that after the divorce, Shelagh's enamel kokoshnik stayed with her ex-husband. Eventually the Grosvenors fell on hard times, and this tiara was sold. In later years, however, the current duke managed to re-acquire the kokoshnik tiara, neatly reuniting it with its original owners and providing his Russian-connected duchess with a proper kokoshnik to honor her heritage. But now, the family is selling again. The auction notes state that the tiara (Lot #397) is being sold "by order of the trustees of the Duke of Westminster." It's projected to fetch between $380,000 and $550,000. Note: Thanks to the Jewellery Department at Christie's for providing images used in this post!